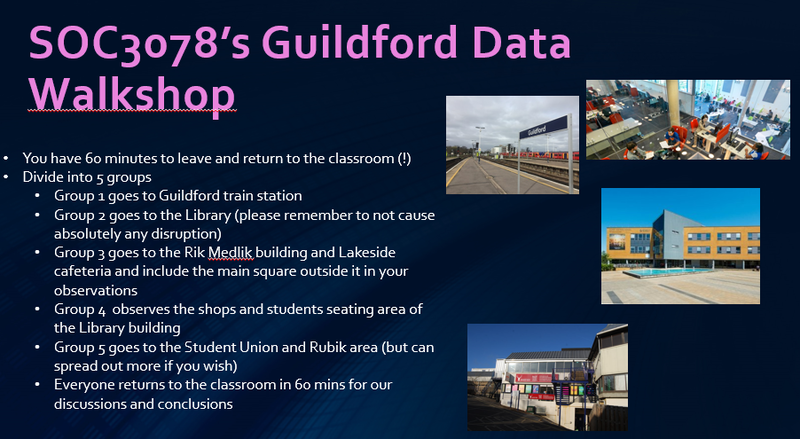 With similar plans in mind we set ourselves the task of going to a variety of different spots in Guildford to consider the subtle and often unnoticeable ways in which the streets we walk on, the shops we shop at, the food we eat, the everyday life we live – is increasingly datafied. While the ideas I set out are suggested in the snapshot below, students selected their own venues and locales and came up with some fabulous notes. One group said – “Myself, Tara and Alice went to Starbucks to observe the data collection going on around us, it was evident straight away that data was being collected in a variety of ways, for example, the till systems at the Starbucks counter, contactless payment, CCTV and access to the cloud through the public wifi. 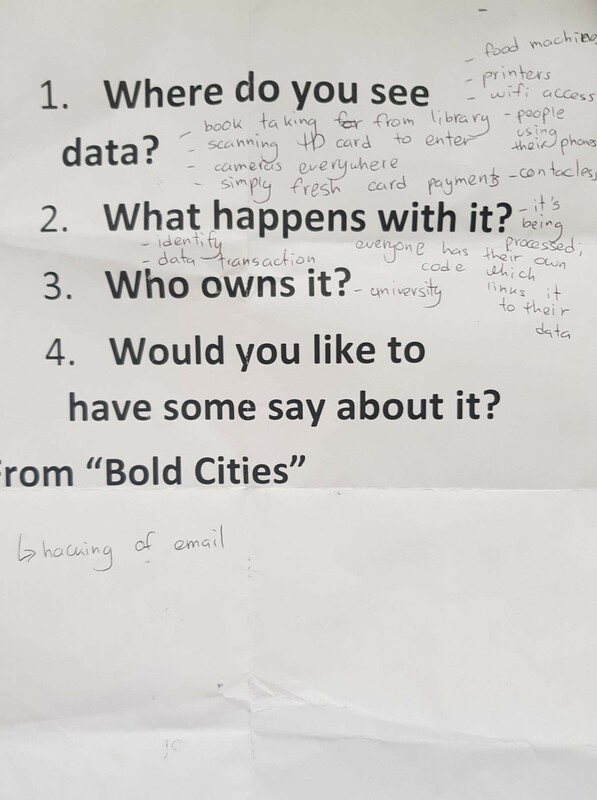 We discussed the different ways in which this data would be used, for example, via contactless payment Starbucks collect our bank information and our banks collect data on what, when and where we are making purchases. Signing into the public wifi also allows for huge amounts of data to be collected on us as it isn’t a secure network, including our location and the data stored in our cookies. Another group visited the library shop and foyer area and the library itself. They made hand-written notes. As per the second figure sent on by Vivian on behalf of her group – made a series of notes around everyday objects – food machines, printers, scanning machines, the Simply Fresh shop and the use of contactless cards which collate data on the purchases made – reflecting on the shift from cash to contactless. It was an engaging exercise and massively fruitful to head out of the classroom and look at everyday life. On returning after the 60 minute walkshop, nearly all groups noted the increasingly “natural” status of datafication and metrification in everyday lives, critiqued succinctly by Couldry &Mejias recently. They note – “The capture and processing of social data unfolds through a process we call data relations, which ensures the “natural” conversion of daily life into a data stream. The result is nothing less than a new social order, based on continuous tracking, and offering unprecedented new opportunities for social discrimination and behavioral influence”. That is precisely what we shall continue to look at as the weeks progress this autumn.